There was no summer houses in Kongsmark Strand - In stead we shows summer houses in the neighbour villages to Kongsmark Strand. 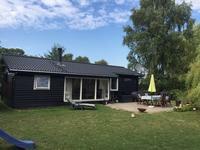 70m2 for 6 people close to wood and beach in green surroundings. The house is well designed with three rooms and a central family kitchen. The house is insulated for use during the winter season and equipped with heat pump and wood stove. 6 persons 3 bedrooms Dishwasher Washing machine Woodburner Distance to beach: 300 m.